Notice and agenda filed in the office of the City Clerk and posted at City Hall at 4:45 p.m. on Friday, June 29, 2012. A. Approval of June # 3 Payroll in the amount of $44,237.34. B. Approval of Claims in the amount of $28,332.19. C. Approval of Minutes from June 18, 2012 Regular Meeting. D. Approval to renew contract between City of Collinsville and Tulsa Metro Chamber. 25 O.S. 307 (B) (2) discussing negotiations concerning employees and representatives of employee groups. 25 O.S. 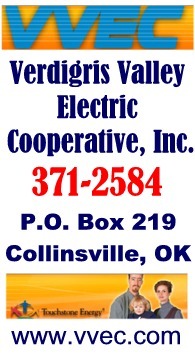 307 (B) (4) for confidential communications with City Attorney pending litigation  Jones v City of Collinsville. 10. Discussion and possible action on matters discussed in Executive Session. -- no action or discussion in open session. 12. Discussion and possible action regarding removal of shredded tire fall protection and seek replacement with pour in fall protection. -- Approved (~$26K for colored surface similar to adjacent play area). 14. Discussion and possible action of appoint Melodie Bateman to the Personnel Board with term expiring July 1, 2015. -- Tabled. Bud York indicated he had no problem with Melodie in that position but was concerned with the nomination process as it was made by another commisser (not the mayor). Although the city charter/ordinances seem to allow that nomination option for this position, Bud indicated he could not recall any other nomination not being made by the mayor and wanted the process explored more before proceeding. Based on a recent version of the boards on the city's web site appears Mike Sheehan's term expired 7/1/2012, but that was not discussed Monday evening -- Ted. 17. Discussion and possible action to award RFP on Multi-Hazard Mitigation Plan Update. -- Approved. The city has a $35K FEMA grant for this and a low bid of $31K by Andy Armstrong Consultants was accepted. A. Approval of June # 3 Payroll in the amount of $28,410.52. B. Approval of Claims in the amount of $102,136.79. * Depot Museum to be painted soon (yellow and green for Santa Fe). HVAC work should allow inside work soon. Caboose will be painted black and yellow (to match historic Rock Island colors) instead of the red it has been since being moved here. An Eagle Scout candidate (Josh McBlair) will help with this process.